Solo: A Star Wars Story may not have been the massive hit (at least when it comes to the box office) that Disney & Lucasfilm were looking for, but now that it's available to own as a digital download and on blu-ray, DVD, and 4K Ultra those who missed it have the chance to catch up and those who saw it the opportunity to relive it whenever they want. The movie itself is a lot of fun. Alden Ehrenreich and Donald Glover do an excellent job embodying the roles Han Solo and Lando Calrissian, and the rest of the cast brings to life some great new additions to the Star Wars mythos. 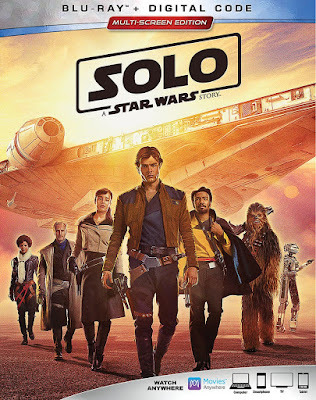 Solo also packs in some memorable action sequences as it tells a new chapter in Han's life, one that sets him on the path to becoming the man Luke Skywalker and Ben Kenobi meet in the Mos Eisley Cantina. Naturally, the home media release also comes with several bonus features for fans looking for more, which is what we'll be focusing on in this review. Of the features that were included, the one that should become a staple of all Star Wars home media releases was the cast roundtable. Moderated by Ron Howard, this featurette brought together the main cast of Solo to tell stories about their time working on the film. The roundtable has a laid back atmosphere, allowing the personalities of the cast, as well as their chemistry, to shine through. This leads to lots of fun anecdotes about what it was like on set, as well as the background that they brought to their part (Thandie Newton, in particular, has a great story about what drew her to Val). It's quite entertaining and the sort of thing I would have loved to have seen with the casts of The Force Awakens, Rogue One, and The Last Jedi. Another unique aspect of Solo's home media release is that several of the deleted scenes are actually extended scenes. Which is to say that the scene still exists in the movie, just in a shortened form, and what's been included on the home media release is the full length version. We see this for three of the eight scenes, specifically Han and Chewie's fight, Han's introduction to Dryden Vos, and the battle of Mimban. It's an interesting way to see the scenes and a great way to highlight some of the cool material that was shot but ultimately didn't fit in the movie. There’s no standout deleted scene that I wished had been included in its entirety in the movie, which I suppose is actually a good thing. However, one scene I want to highlight is the first one, which serves as a different introduction to Qi’Ra. The basic information of the scene is the same, with Han returning to Proxima’s Den and meeting up with Qi’Ra before being brought before being caught by Mulloch. Only in this version, instead of Qi’Ra and Han meeting an embracing in the hallway, Han wakes Qi’Ra up in her bunk and she responds by holding a knife to his throat fearing he might be someone else. It is understandable that the scene was rewritten and reshot to put the emphasis on Han and Qi’Ra’s relationship, however the deleted version highlights the dangers of living in Proxima’s lair in a way the final film doesn't. Which is not to say the film makes the place look like an even remotely nice place to live, however the idea that Qi’Ra feels the need to sleep with a knife under her pillow, ready to strike at any moment, adds an extra layer to their desire to get out of there. Ultimately, the scene in the film works better, but it is interesting to see just how dangerous life as a scrum rat really was. The behind the scenes featurettes offer some cool insight into what went into making the film. The one about the Corellia speeder chase in particularly was fascinating. It's always interesting to see how the production crews innovate new ways to shoot the scenes, blending practical and digital effects. This mixing of old school and new school filmmaking techniques is something that is emphasized a lot in all the extras, including how L3-37 wasn't just a motion capture performance (like K-2SO) but a combination of a costume and motion capture. Fans of the behind the scenes details will find lots to enjoy in these featurettes. Given the troubled nature of the production (with original directors Phil Lord and Chris Miller being replaced over halfway through filming by Ron Howard, who re-shot most of the film), I was curious to see how the situation would be addressed in the behind the scenes material. The answer: almost not at all. In the cast roundtable Ehrenreich and Howard refer to Howard’s first day being after the "hiatus", but that's as close as it gets. Lord and Miller aren't even featured in any behind the scenes pictures or video from the set. It's an understandable, but disappointing decision. The Lord and Miller situation hung over the film ever since their departure was announced, so it makes sense that Lucasfilm would want to avoid highlighting it on their own release. However, there is no denying that the directing duo had a major impact on this film that they had been working on since 2015 and leaving them out did make it feel like something significant was missing from the story of the film's making. As a result, there are noticeably less extras (no director's commentary and no feature length documentary) than were included on the home media release of The Last Jedi back in March. Though, to be fair, there was more than what was included on the 2017 home media release of Rogue One (which also faced its share of behind the scenes shake ups well into production). While it doesn't live up to the high standard set by the home media release of The Last Jedi, the Solo release does have some fun extras for fans of the film. The cast roundtable is the standout feature of this release, and will hopefully become a regular on future Star Wars blu-rays and digital downloads. While the future of more young Han Solo stories may be in doubt, the home media release is a worthwhile purchase for fans of the film and those looking to see what they missed in theaters.